The AroCell TK 210 ELISA Assay kit is a quantitative immunoassay for the determination of Thymidine Kinase 1 (TK1) in human serum. The TK 210 ELISA Assay kit is For Research Use Only. The performance characteristics of this product have not been established. Thymidine kinase is a protein that phosphorylates thymidine to thymidine-monophosphate, a component required for DNA replication. Thymidine Kinase 1 (TK1) concentrations in the cell are low in the G0/G1 phase (resting phase) of the cell cycle but increase during the S/G2 phases, when DNA replication occurs, and then decrease during mitosis. The presence of TK1 in cells is thus an indicator of active cellular proliferation. Sustained cell proliferation is a hallmark of cancer. Up-regulation of TK1 occurs during cancer development and elevated TK1 levels have been reported also in pre-cancerous conditions.TK 1 enters the blood stream through the death and disintegration of tumor cells, and TK 1 enzyme activity can be measured by analyzing serum samples from patients. 95% of serum TK1 activity in cancer positive samples is apparently tumor derived, making the measurement of TK1 an excellent indicator of proliferation and cell turnover, and tumor growth. Recent research has shown that serum TK1 enzyme activity is elevated in subjects with many forms of cancer, including leukemia, lymphoma, prostate, breast, lung, sarcoma and colon cancer patients. However, methods based on the measurement of the activity of TK1 in serum may underestimate the quantity of serum TK1, due to the fact that TK1 may remain inactive in serum, especially in serum from subjects with solid tumors. Furthermore, serum TK1 occurs as aggregates with a range of molecular weights and specific activities and this distribution differs between serum from healthy subjects and those with tumors. 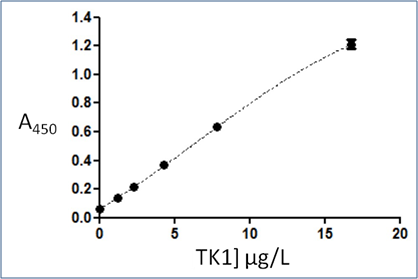 The AroCell TK 210 ELISA brings the specificity and sensitivity of immunoassay to the assay of TK1 and offers improved accuracy, especially when studying serum TK1 derived from patients with solid tumors. The AroCell TK 210 ELISA measures the concentration of TK 1 in the entire body, including both active and inactive forms of the TK 1 enzyme. This is possible by binding to the TK 210 antigen site, an antigen expressed in both active and inactive forms of the enzyme present, resulting in a more accurate representation of TK 1 present. The AroCell TK 210 ELISA Assay kit procedure includes pre-treatment of the samples with a sample dilution buffer that makes TK1 aggregates more readily accessible for immunoassay. A study comparing TK1 levels in healthy and breast cancer subjects showed the AroCell TK 210 ELISA to better distinguish between these groups than an enzyme activity assay. The AroCell TK 210 ELISA will provide new opportunities for studying cellular proliferation, tumor cell turnover and therapy response in subjects with solid tumors. 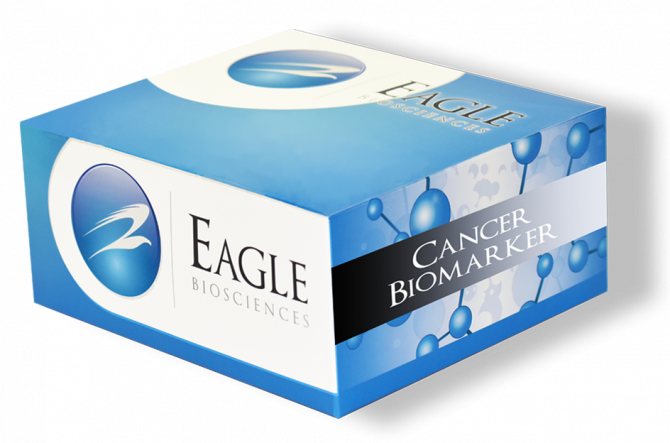 Using the AroCell TK 210 ELISA Assay kit in conjunction with other cancer biomarkers (e.g. CA 15-3, PSA, etc. ), improves the detection of cancers, the different biomarkers monitor different aspects of tumor growth and therefore increase the detection of tumor growth. Some studies found that, together with that of traditional tumor biomarkers (e.g. CA 15-3), TK1 activity provided an indication of the rate of cell proliferation and cell turnover, while other markers were related to tumor mass. The AroCell TK 210 ELISA Assay kit is a quantitative enzyme immunoassay. The test procedure is based on the sequential addition of sample, a biotin labeled anti-TK1 monoclonal antibody, streptavidin labeled enzyme-conjugate and substrate to Microtiter wells coated with another monoclonal anti-TK1 IgG. The resultant color intensity is proportional to the amount of TK1 present in the sample. The assay range is approximately 0-17 μg/L and the total assay incubation time is 4 hours and 45 minutes.